Two successive weekends without Spurs playing are reducing true Lilywhite supporters to being like gourmets denied food. Then suddenly we are going to be gorging ourselves, particularly with the Champions League quarter-final draw pitching us into three matches against mighty Manchester City in just ten days. There is also, of course, the little matter of returning to action at Liverpool on Sunday week before the grand opening of the state-of-the-art stadium against Crystal Palace on Wednesday April 3rd and the launch of an exciting, new Tottenham era. I start to shiver just thinking about the Spurs spring, and wonder how we will all be feeling come the end of April, apart from exhausted? Oh to be Mystic Meg. How best to fill our time waiting for one of the most vital periods in Spurs history to kick-off? Let�s disappear into the past for a while. Unashamedly plugging my paperback Spurs �67 book, I invite you to come back with me to 52 years ago this month. But after their 2-0 defeat, all the Bristol City players insisted that Worcester referee Ken Burns DID send Mackay off following an angry second-minute clash with fellow-Scot Johnny Quigley. Two misses in particular � both from the penalty spot � will haunt City for the rest of the season. Right-back Tony Ford tamely shot the first into the arms of goalkeeper Pat Jennings after Mike England had handled in the 75th minute. Two Tottenham players had strayed into the penalty area while the kick was being taken, and referee Burns ruled that City should have a second crack. Chris Crowe, back to the superb form that made him a hero at Wolves, nominated himself to take the kick this time and placed the ball firmly on the spot. He retreated 20 yards for the longest run-up I have ever seen and then sped towards the ball like Olympic champion Lynn Davies on the way in for a long jump. But Crowe must have felt for the high jump as he screwed the ball yards off target. This was the end of a courageous City comeback that shook Cup favourites Spurs after they had given the Second Division team a first-half pounding. Jinking Jimmy Greaves scored a superbly stuck 10th-minute goal after collecting a beautifully delivered defence-splitting pass from Terry Venables. Then Spurs made and missed another half dozen chances before lapsing into a coma of casualness that so nearly cost them victory against a City side that played to the peak of their power. Up in the press box, we were convinced the referee had pointed to the dressing-room when Mackay made his reckless early challenge, but Mr Burns refused to comment. 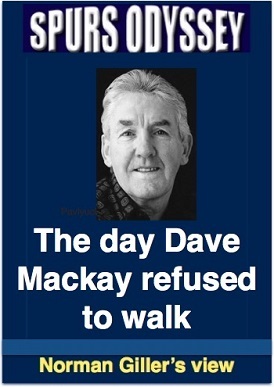 It was years later when I dragged the truth from the indomitable Dave, arguably the greatest player ever to pull on the Lily-white shirt and who was making a comeback after twice breaking a leg. Phil Beal, reliable and dedicated defender who had been with Tottenham since signing as an amateur in 1960, was a valued member of the squad, but he badly broke an arm in a fall during the First Division match against Manchester City in February. It virtually ended his season, and he had the frustration of training and knowing that the plaster cast on his arm would prevent him being considered for selection. Beal, fresh faced, honest-as-the-day-is-long and a compulsive prankster, was encouraged by his team-mates to keep his spirits up, but it was painful to watch him having to go through the motions in training but without the satisfaction of playing. It was like being at a party with an empty glass. You had to be wary of Joe�s sense of humour. He was a born joker, and I remember him giving a young female magazine reporter an interview in which he talked of his poor old blind mother bringing him up along with his seven brothers in total poverty after his father had died when he was a babe in arms. He made it all up and it went into print, much to the hilarity of Joe and his team-mates..
Joe, capped for the first time by the Republic of Ireland in February 1967, was establishing a partnership with the charismatic Cyril Knowles, Yorkshire-born left back who was winning fans and influencing results with his skilful and at times eccentric play in the No 3 shirt. Kinnear and Knowles were like the Dier and Alli of their time, in harmony on and off the pitch and always pulling pranks and winding each other up. While Cyril was telling me this in an interview at Tottenham�s Cheshunt training ground, the crafy Kinnear had sneaked up and lifted my portable typewriter from the table. I later found it balanced on the crossbar of one of the goals. Joe was serving his apprenticeship for the practical jokes he got up to with the Wimbledon Crazy Gang when he was their larger-than-life manager in the 1990s. There were clear signs as the season reached the business end that Bill Nick was getting close to his ambition of building another �Super Spurs� side after the devastation of the Double team�s break-up in 1964. Goalkeeper Pat Jennings had conquered his early nerves and was growing in confidence as he developed an understanding with centre-half Mike England, who was filling Maurice Norman�s No 5 shirt with an impressive mix of style and strength. In the midfield engine room, Dave Mackay was again breathing fire into the side and, vitally, Alan Mullery and Terry Venables were at last winning the fickle fans over with their passing and passion. Okay, they were not Blanchflower and White, but they were now stamping their own powerful personalities on the team and could be favourably judged for what they were achieving without supporters playing the pointless comparison games. Up front, of course, Greavsie and Gilly were destroying defences with their decisive finishing and brilliant invention. It was so good that even demanding perfectionist Bill Nick was almost satisfied. From mid-January in 1967 through to the end of the season Tottenham went on a barnstorming, undefeated run that lifted them to third in a First Division table topped by the Matt Busby Manchester United team of Law, Best and Charlton. Spurs went that close to another Double. By the spring of 1967 a team spirit was building on which you could warm your hands, and the sixth round FA Cup draw added to the buzz that this was going to be Tottenham�s year. For the third successive time they drew a Second Division team. This meant a trip up the newish M1 Motorway to Birmingham. 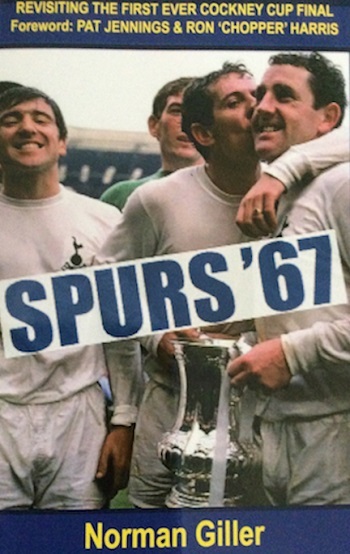 And that�s as far as I am going with this taster from my Spurs �67 book. If you want to read detailed and intimate stories about the rest of that season (including the after-match controversies) you will have to buy the book direct from me. I will sign each copy and make a donation to the Tottenham Tribute Trust. It costs �9.99 plus P&P and can be ordered from www.normangillerbooks.com (details at the lower left of the website page). The book is an anthem of acclaim to Bill Nicholson and the mighty Mackay, and is introduced by goalkeeping genius, the peerless Pat Jennings, and the man who was Chelsea skipper for the first Cockney Cup final, the famed and feared Ron �Chopper� Harris. Please support this great cause. Thank you. Who lined up alongside Jimmy Greaves in his Chelsea and Tottenham debuts, and which London club did he join from Spurs? Please email your answer to me at SOQL31@normangillerbooks.com. Deadline: midnight this Friday. I will respond to all who take part. This year�s prizes for the champion: A framed Harry Kane autographed picture, two books from my Spurs collection with autographs from Jimmy Greaves, Steve Perryman and Dave Mackay, and (most precious of all) a framed certificate announcing the winner as SOQL champion. Last week I asked: Which defender has won 43 caps, and for which Danish team did he play before joining Spurs in 2014? Few of you fell for the Danish red herring. As if I would try to trick you! The answer of course is the left-back Ben Davis, who as a youth briefly living in Denmark played for Viborg FF. Please keep a check on your scores. I will be trusting you to count your points as I do not have faith in my email server. Thank you for taking part. See you back here same time, same place next week. Keep the faith. COYS!